Play Bling! Bling! 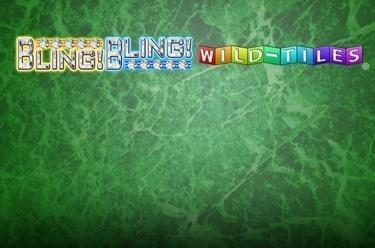 Wild-Tiles® online for free now! Bling! Bling! Wild-Tiles® is all about sheer decadence. 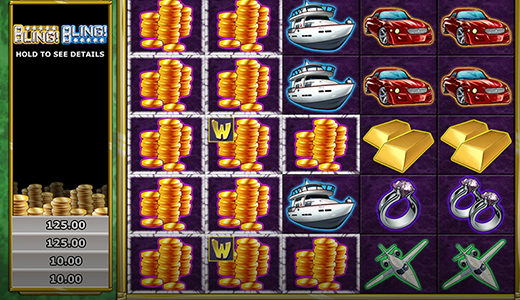 No matter whether you’re a fan of yachts, private jets or sportscars, you can enjoy the best of the best on the 5x5 gaming grid of this luxury slot! And who knows, perhaps this slot will catapult you into the ranks of the Twist millionaires. Note: The Wild symbol has the highest win value! Three, four or five matching symbols side by side in a line (horizontally or vertically) land you winnings. As soon as you achieve a win with three symbols, the winning symbols vanish from the reels. A Wild will then appear in the middle winning position, and the two remaining fields will be filled by the symbols that fall from above. This chain reaction continues until no further winnings are achieved or the playing field contains no more symbols. Each time this process is triggered by a win, the win multiplier increases by one. If the winning chain reaction completely empties the reels, you receive an additional win! As soon as the Bonus column is cleared of symbols, the Bonus game is triggered. The Wild symbol can substitute for any other symbol to complete winnings. Moreover, every win with three symbols grants you another Wild. One or more “Bonus” signs may appear before every spin. If this Bonus column is completely emptied of symbols by winning, the Bonus game is triggered. This feature begins when the Bonus column is emptied. At first you will see a 7x5 grid with question marks. To the side you will be shown how many matching symbols are required to level up. Simply take your pick from the question marks by clicking on one. The symbol and winnings hidden behind it will be revealed, as will all of the matching symbols. Get enough symbols and you’ll progress to the next level. If not, the game ends. Want a taste of high society? Play Bling! Bling! Wild-Tiles® and mix it with reel high rollers! You’ll see that the chance to win glittering Twists is too tempting to pass up!